/ Modified jun 1, 2018 12:39 p.m.
Charles Brandt is a retired, long-time teacher in Arizona. He has been well entwined with technology since the Commodore 64 and the TRS 80 — two computers he owned at one point. However, he admits the sophistication of 21st century devices has far exceeded his expectations. "The amount of memory on an older computer is nothing compared to your cell phone. Your cell phone has so much more power than that. I have seen it grow tremendously, and it doesn't have a stopping point either," Brandt said. When Brandt got his first iPhone he imagined he was like a lot of people who bought Apple products: His children owned the same products and could help. 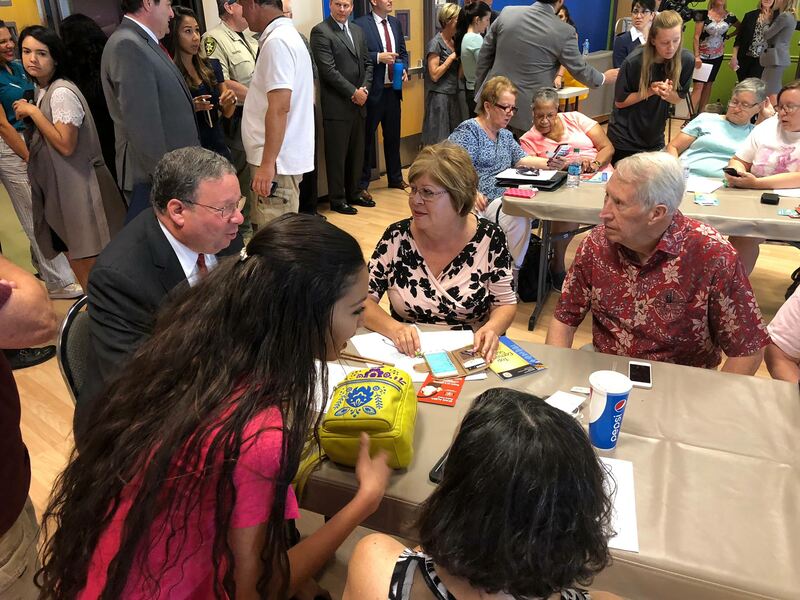 But he chose to be a part of a pilot program that started in New Mexico and is making a footprint in Tucson, called Teeniors. Teeniors are tech-savvy teens helping senior citizens learn technology through one-on-one personalized coaching, according to founder and CEO Trish Lopez. "As a teacher, I taught kids for over 30 years, and now it's like a reverse role," Brandt said. "They're going to teach us some things too, so we gotta switch places a little bit." 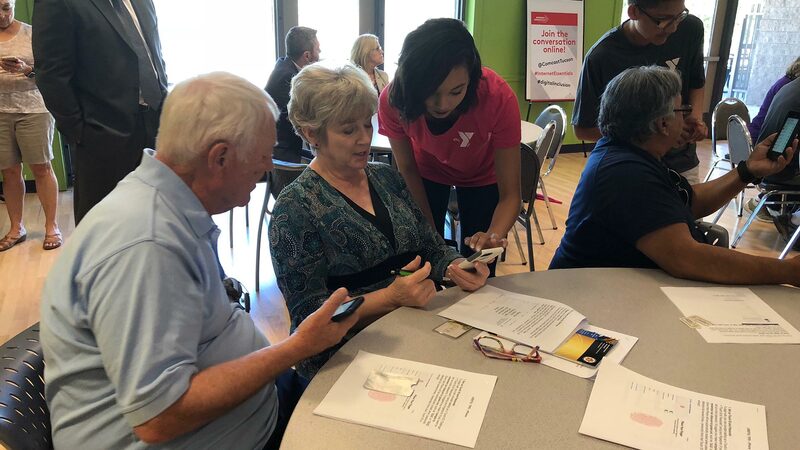 David Cohen from Comcast meets with seniors at the Northwest YMCA as part of the Teeniors pilot workshop to talk to them about the internet package Comcast is offering for low-income seniors. The impact has been so great since the program launched that Comcast decided to partner with Teeniors. The company also created an internet-essentials package specifically for low-income seniors, according to David L. Cohen, senior executive vice president for Comcast. Cohen said he recognizes how Teeniors is addressing a fear of the internet that many seniors experience. "That is [through] specialized digital-literacy training and internet training for the elderly, coached by teenagers," Cohen said. Lopez visited Tucson in early May to hold a mini training orientation with seven teens through the Northwest YMCA's youth organization. Days later they would be coaching around 50-60 seniors who had questions about internet safety and security. Trish Lopez CEO and founder of Teeniors, explains how the workshop works before teenage coaches begin teaching seniors. One of the teens was 19-year-old Joy Mona. She shared with seniors tips like not having the same password for everything. "Even if you have to write it down on paper because you can get hacked," Mona said. Mona got her phone when she was 10 years old and has around 10 passwords between all of her social media accounts. "I can't live without my phone because the world, unfortunately, it works with it, so we got to keep everyone up to date," she said. In just under three years the nonprofit has worked with over 1,000 seniors and employed more than 40 teens. 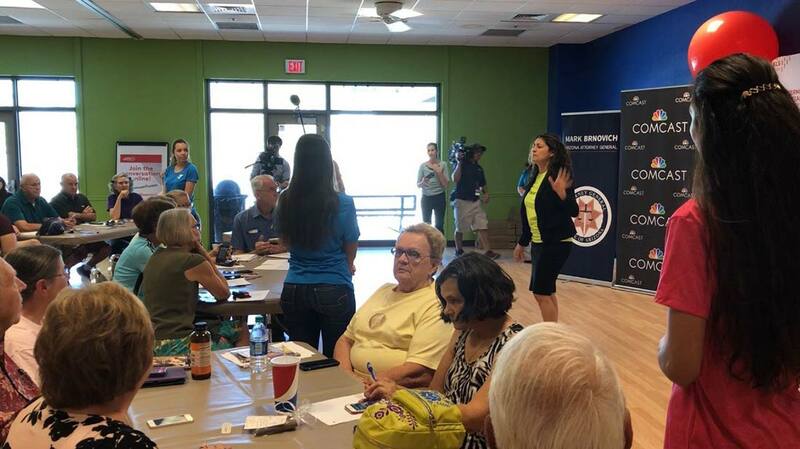 "Our goal is to empower older adults to connect with their loved ones, engage with their community and the world through technology while also providing meaningful paid jobs for teens and young adults," Lopez said. Cohen reminds seniors what they can learn through a program like Teeniors. "To be able to FaceTime with your grandchildren, to be able to have your children load an album of photos from your grandchild's fourth birthday party as if you were there, to be able to communicate with your doctor — please don't cut yourself off from the world and all the advantages of the internet," Cohen said. Teeniors workshops will start in July at the Northwest YMCA.